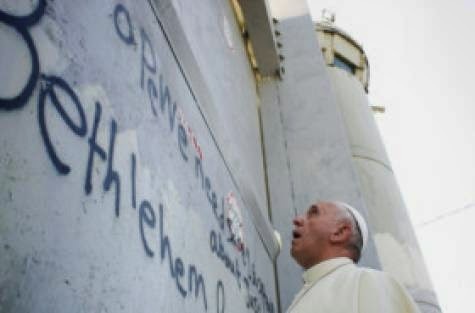 Pope: If Only I Had A Wall Like This ! That’s my caption for this iconic photo. If he had a wall like this, his flock might be better protected from Islamist killings which have now reached epidemic proportions. Like in Nigeria, where last week 162 were killed and another 120 injured by two bus bombs set of in a market in the Christian district. Or the previous month when 105 were massacred and 50 left wounded in the Christian village of Yar Galadina. Or in Somalia where a girl was pulled out of her Mogadishu home and killed for confirming her Christian faith. Or Kenya where, in March, gunmen shot 6 and wounded 17 in a Mombassa church while shouting Allahu Akhbar. Your Holiness – please check out this exhaustive list of Islamist attacks on your people since 9-11. This may be a new phenomenon for you. But take it from us – the most hunted and oppressed nation in the history of the world. We’ve learned how to look after our own. Support Israel - Shut Up ! 10 Chassidim and their families decided to spend Shabbat in the English seaside town of Blackpool. Unfortunately one of them took ill and they were short of a minyan. One of them went out into the street in hopes G-d would send him a 10th Jew. His sidelocks and strange garb drew inquisitive looks as he searched in vain for a Jewish face among the Saturday morning walkers along the resort’s famous ‘golden mile’. Almost giving up hope he noticed the scowl on the face of an approaching pensioner clutching a shopping bag and newspaper. “Why do you have to walk around looking like that?” said the old man. The Chassid smiled broadly and invited him to make up the minyan. That minyan man is every loathsome Jewish busybody in politics, media and academia. From US envoy Martin Indyk, to New York Times columnist Tom Friedman and his hateful Jewish publishers, to the likes of Norman Finkelstein and Peter Beinart, and the Noam Chomskys and Ilan Pappes of academia. What they all seem to have in common is embarrassment with their Jewishness, but not so much as they will not use it for their own self-aggrandisement and social climbing. All this makes them exceptionally useful idiots of the Palestine propaganda machine and all those on the hard Left who assail the legitimacy of the Jewish state and use that as a fig leaf to cover their base anti-Semitism. I doubt whether Friedman would have got very far if his name was Johnson and he had been writing about Turkey’s occupation of northern Cyprus for the last 40 years. Similarly Chomsky might not have done nearly so well in academia with a non-Jewish name and without lacing every other lecture with visceral attacks on his ancestral homeland. Jews have created a minyan in their promised land. They’ve tilled the land, fought the wars and are paying the taxes. If Jews in the diaspora are uncomfortable with that, let them turn away. But don’t lecture us on how we should look and conduct ourselves. If you’ve got nothing nice to say, don’t say anything at all. Apartheid & Israel – it’s true. But not in the way Secretary Kerry or BDS-merchants portray it. Apartheid is defined as ‘a system of discrimination on grounds of race’. No country is discriminated against more than Israel. It has been singled out for more UN censures than any other state, in a world filled with tyranny, terrorism and travesties of human rights. It is demonized in the media and academia and held to double-standards in its acts of self-defense and the protection of its citizens. Natan Sharansky invented the 3D test for anti-Semitism as distinct from legitimate criticism of Israel. There had to be demonization, delegitimisation and the application of double-standards. Unquestionably all 3 are in evidence and fuelling the boycott and divestment movement so zealously directed against the one single Jewish state on the planet. Israel is the Jew among the nations – and is very clearly the subject of discrimination on grounds of its race. So yes, there is Apartheid in Israel. But the Jews are its victims. Today Naftali Bennett successfully introduced a Knesset law to prevent the future release of terrorist killers. He is Israel’s Economy Minister. Surely this is a job for the Justice Minister – Tzipi Livni ? Unfortunately she is far too busy trying to give away parts of Eretz Yisrael to people who refuse to recognise the Jewish State or change their charter which calls for the destruction of Israel by military force. Whilst it’s absurd that Bennett should have to be doing Livni’s job, it’s even more bizarre that Livni is in the position of croupier on our territorial table. Israelis in the last election clearly voted to consign her to the dustbin of history along with the discredited Kadima party which was born in the sin of disengagement and was buried in the mire of Olmert’s sleaze. But in this age of recycling, all trash has some usefulness. Netanyahu appointed Livni to force Lapid and Bennett off the fence and into serious coalition talks. Justice sounded like a good title and the peace negotiation role was a useful sop to the Oslo dreamers. But if that usefulness didn’t end with the sealing of the coalition agreement, it should certainly have expired with the collapse of the Kerry talks. 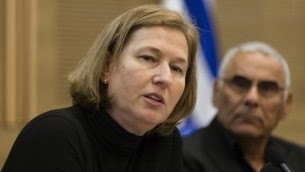 Livni should be instructed to take over Bennett’s initiative as Justice Minister or resign. And since Abbas now thinks he has his own state, there’s no more suitable person to deal with ‘negotiations’ than Avigdor Liberman, as Foreign Minister. Israel keeps celebrating Independence Day each year and yet is still far from it. We continue to allow external forces and events to determine our national agenda; constantly reactive rather than proactive. Countries like Britain and India would go to war rather than surrender far-off outposts like the Falklands and Kashmir, and yet Israel has given up vital border territories like South Lebanon and Gaza only to see them occupied by Iranian terror proxies, Hezbulla and Hamas. It is now expected to surrender far more critical territory in the West Bank, within stinger range of Ben Gurion airport. This is not how an independent state behaves. Madrid, Oslo, Geneva, Wye, Rogers, Tenet …. for decades Israel has allowed itself to be bounced from one peace plan to another like a pinball. Each time a game ends, a new American president flips the ball back into play for another round of Israel being bounced from pillar to post without any real resolution. Sometimes, it gets rough and they push the table to get their way. Independence means growing up and making one’s own decisions. To use the pinball analogy, we need to get our own hands on the flippers. Israel has become of necessity the most expert nation in security and national defense. No-one is more qualified to determine safe borders than Israel itself. Not America, not the EU nor the UN. So, imagine asking the Israeli cabinet: “What would be your ideal borders from the demographic and security points of view?” Then ask them: “What’s stopping you?”. The answer will almost certainly be: the Americans will never agree, or the EU or UN wouldn’t agree and we would become isolated politically and economically. If the West Bank were just an outpost like the Falkland Islands or Kashmir there might be justification to make a goodwill gesture to get brownie points in the world. But we don’t get brownie points … ever. No matter what we give away, we get rockets from our enemies and blame from our friends. So, with nothing to lose, maybe we could finally declare TRUE independence this year and write our own map. After all, it’s not as if we were Russians stealing Crimea from Ukraine. The land was ours to start with. And if we ever have the guts to take it off the bargaining table, the world might finally start believing it.